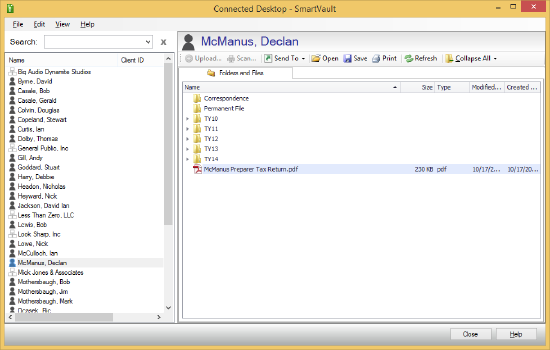 You can use the Connected Desktop to upload files to SmartVault. Be careful to only upload files directly to a folder. If you upload a file without a folder selected, the file will be uploaded to the client vault outside of any folders. 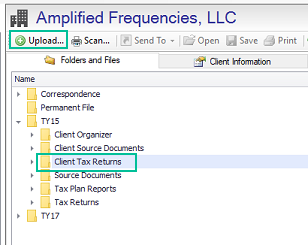 Since your clients have access to certain folders in the client vault (such as the folders Client Tax Returns, Client Source Documents, and Client Organizer), any files stored outside of a folder in the client vault will not be visible to your clients. Note: If you are a guest who was invited to SmartVault, you can use this guide to learn how to upload files. 1. Select a folder in a client vault in the Document View pane and click Upload in the Document View toolbar. Note: Alternately, you can right-click on the folder and select Upload. 2. A window opens that allows you to browse to and select the file(s). Note: To select multiple files, press the CTRL key as you click on the files to upload. 3. Click Open. 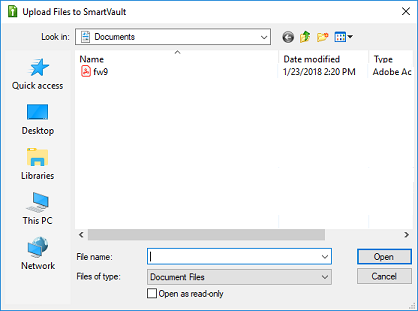 The file(s) are uploaded to SmartVault.